Automotive manufacturers are utilizing microcontrollers for a wide range of requirements including seating, power steering, engine control, and antilock brakes. Leading players in the global automotive microcontrollers market are emphasizing more on developing software, which is required for proper functioning of automobiles. A new report by Transparency Market Research has identified key players actively contributing to the market expansion. These players include Texas Instruments Incorporated, NXP Semiconductors NV, STMicroelectronics NV, Microchip Technology Inc., Renesas Electronic Corporation, Silicon Labs Private Limited, Fujitsu Limited, Maxim Integrated Products, Inc., Infineon Technologies, and Toshiba Corporation. Microcontrollers are now being adopted in infotainment systems, providing connectivity to vehicle network. Hybrid electric vehicles have witnessed a surge in popularity, owing to their energy efficiency. These vehicles require comparatively more microcontrollers than conventional vehicles. Although cost of microcontrollers remained lower in the recent past, tags for microcontrollers will witness a gradual hike over the upcoming years. This is likely to lead toward an increased prices of vehicles. Furthermore, integration of microcontroller is likely to remain challenging for automobile manufacturers, which can be attributed to their complex design. One of the key trends observed in the global automotive microcontrollers market is utilisation of microchips to make improvements in the vehicle’s connectivity with its moving systems, and to enhance the vehicle’s flexibility. An automotive microcontroller enables increasing the execution speed, allows automatic control sensing, and improves safety features including the high temperature control and air bag control. Currently, microcontrollers are being implemented in sophisticated safety features, such as blind spot detection, surround view cameras, automated braking & lighting, advanced driver assistance systems (ADAS), and lane change warning. The global automotive controllers market will register an impressive CAGR of over 10% during the forecast period (2017-2022). Over US$ 1,600 Mn revenues will be accounted by sales of automotive microcontrollers across the globe by 2022-end. With convergence of transportation, automotive, and ICT sectors, Asia-Pacific excluding Japan (APEJ) has been witnessing an increase in demand for cars that are technologically advanced. This has led toward advent of advanced vehicle ecosystem in the region. Introduction of driving assistance technology in APEJ have prompted OEMs in opting for efficient microcontrollers for catering to current market requirement. These factors are expected to propel the market for automotive microcontrollers in APEJ. APEJ will become the most lucrative market for automotive microcontrollers by 2022-end, surpassing North America, which was the largest market for automotive microcontrollers in 2017. Tinned steel will remain sought-after among materials by manufacturers of automotive microcontrollers, followed by copper alloy. Revenues from sales of these two materials for production of microcontrollers will collectively account for over two-third share of the market during 2017 to 2022. Heavy commercial vehicles will remain dominant among vehicle type in the global microcontroller market, in terms of revenues. However, sales of automotive microcontrollers in light commercial vehicles will register a relatively faster expansion through 2022. 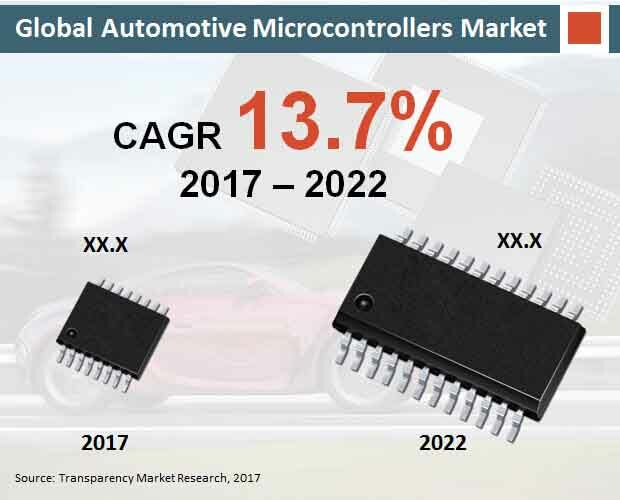 Although premium passenger cars will remain more lucrative than light commercial vehicles in the market, sales of automotive microcontrollers in the former vehicle type segment will reflect a comparatively lower CAGR than the latter through 2022. Sales of automotive microcontrollers in electric vehicles will register the second highest CAGR in the market through 2022. On the basis of application, ADAS and parking assist system will account for approximately similar revenue shares of the global automotive microcontrollers market during the forecast period. Brake control system will continue to be the largest application of automotive microcontrollers throughout the forecast period.